Curated by Robert Lee. 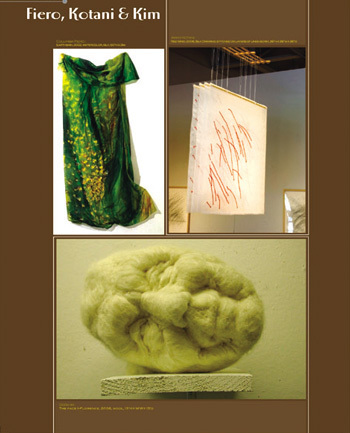 The three artists were selected for their innovative use of fibers, which are physical yet convey an intangible touch of the lightness of air. An exhibition of Chinese Tribal Textiles from the Minority Peoples of China held alongside the Fibers exhibition. The exhibition included museum quality fabrics representative of historical tribal traditions. They are from the peoples known as: Miao, Gejia,Yao, Yi, Dai, Li, and Zhang, and include garments, banners, festival jackets and blankets. The collector of these tribal arts and textiles, Dr. Andrew Wang, gave a talk on this exquisite display of pattern and skill, the highest embroidery quality of China. Yeong Gill Kim is a Korean American artist who has lived in NY for many years. He saw the transition in Korea from a feudal society to a modern country and the confusion it brought to the people. By 1995 he had given up purely contemporary idioms and returned to materials and ideas that had inspired so much of Korea's artistic tradition. Inflected by modernity in the uniformity of the color of the strokes, by the washed surface, his gesture to contemporary times is there, and to that extent, to the West. The complexity of his brush work on muslin has attained a breathtaking clarity and simplicity. An artist trained in the Japanese art of Ikebana, Marie Yoho Dorsey has turned her skilled mind to the art of painting, collage and installation to create delicate and masterful renderings on fabric, mystical journeys through landscapes and clouds despite the noise of the cities of New York and Florida. ARTSLAM is part of a series of events allowing emerging artists the opportunity to present their work, as well as meet and network with established artists and critics/curators.